Ross Lipman, Notfilm, 2015, digital video, color, sound, 125 minutes. 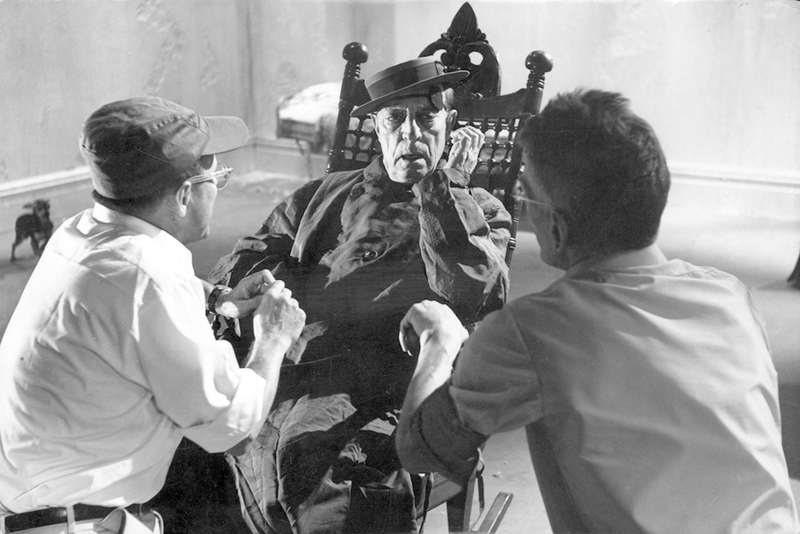 Alan Schneider, Buster Keaton, and Samuel Beckett. IN 1964, the great playwright and novelist Samuel Beckett began his only venture into cinema. The twenty-two-minute Film, as it was eventually titled, was a collaborative effort of formidable talents. Directed by Alan Schneider, the premiere American interpreter of Beckett’s plays, it starred silent comedian Buster Keaton, was photographed by On the Waterfront (1954) cinematographer Boris Kaufman, and produced by Barney Rosset, legendary founder of Grove Press, the first US publisher of Beckett and such other figures of the European avant-garde as Genet and Ionesco. It premiered at the Venice Film Festival in 1965, was screened at the New York Film Festival that same year, and subsequently opened commercially. Judged a dismal failure by critics, audiences, and Beckett himself, Film appears to be a minimalist take on existential dread, in which a lone figure (Keaton) is pursued by a first-person camera down city streets and empty lots and into his apartment, shunning all possible gazes. At the last moment he is forced to confront his pursuer, only to see that it is himself. Though the idea seems compatible with Beckett’s theater work, Film lacks both the uncanny lyricism and comic bite of his plays. Critics of the time seemed puzzled about whether it was a serious but failed effort at “art” cinema, or whether it aimed to mock the pretensions of the latter, failing at that too. A third option seems closer to the truth: that it did aim to be taken seriously and, falling flat on its face, inadvertently came across as lame satire. Having seen Film several times before its recent restoration, I’m convinced that its failure has nothing to do with its being deep or over people’s heads, but something far more basic—a misunderstanding of the ontological bluntness of the medium, so naive that the “shock” of recognition to which its final moment aspires is merely a pathetic, even theatrical cliché that we see coming a mile away, and that is preceded by a reckless imbalance between the alleged seriousness of its theme and Keaton’s vaudevillian routine with domestic pets. Problems with conception and execution aside, the great comic himself is utterly out of his element—and I don’t mean that philosophically. The world of Film, its restless moving camera and play with point-of-view notwithstanding, is curiously static—in fact, not filmic, the only realm in which Keaton’s poker face and physical dynamics work. But if Film’s reputation has not improved with time, its artistic pedigree justifies its recent restoration by film restorer par excellence Ross Lipman and Milestone films, as well as the expansive attention Lipman gives its making in his first feature-length documentary, aptly titled Notfilm. Presenting or alluding to more geniuses or wannabe geniuses per square foot than any doc in recent memory, Notfilm includes behind-the-scenes material, rare audio tapes of Beckett and Schneider speaking, photographs, and contemporary interviews with several figures relevant to the project. All have wonderful memories to share, including Rosset himself; the amiable and invaluable film historian Kevin Brownlow; Alan Schneider’s widow Jean; cinematographer and filmmaker Haskell Wexler; the wonderful James Karen, one of the only other actors in Film; and, perhaps most memorably and movingly, the late British actress Billie Whitelaw, known for her riveting incarnations of Beckett protagonists in such works as Happy Days and Rockaby. To understand her intuitive grasp of Beckett’s world and the unpretentiousness with which she embodied it is to know exactly what is missing from Film. Left: Ross Lipman, Notfilm, 2015, digital video, color, sound, 125 minutes. Samuel Beckett and Richard Seaver. Right: Alan Schneider, Film, 1964, 35 mm, black-and-white, sound, 22 minutes. Curiously, the credits for Notfilm list Lipman as writer, photographer, editor, and narrator, but not as director. Does this imply that a director is merely the sum of the other skills? Or is it an attempt at modesty? If the latter, it is belied by the ambition, scope, research, and exhilarating sweep of his project, by his decision to call it a “kino essay”—a calculated nod to Soviet filmmaker Dziga Vertov—and by his sallies into textual interpretation of Film. These are hardly nondirectorial postures, even if Lipman’s thematic readings do little more than reiterate what many others had to say about Film. Shots from Vertov’s Man with the Movie Camera (1929), a film of dazzling formal and technical ingenuity, are the first ones we see in Notfilm, ironically accompanied by Lipman telling us how skeptical he used to be of films about filmmaking. Judging from the role Vertov’s film continues to play in Notfilm, he’s clearly changed his mind. No film could be said to embody more emphatically than Vertov’s the nature and substance of reflexive cinema. Lipman, no doubt inspired by his mentors, dares to intercut imagery from Vertov’s film with the daredevil pyrotechnics of Keaton’s best works. Exhilarating as they are, such gestures, intentionally or not, simply underline the complete absence of filmic genius in Beckett’s Film. In fact, this aspect of Notfilm is both informative and saddening. Keaton, we learn, was not anyone’s first choice. Several actors were consulted but unavailable, including Charlie Chaplin, who was apparently indifferent to the project. Lipman implies, not without justification, that though Keaton was a kind of last resort, Beckett’s hitting upon his name had a fortuitous ring. Indeed, there is an effort here to portray Beckett and Keaton as artistic souls under the skin, doppelgängers with kindred views of the world. But their first meeting did nothing to confirm any such rapport, and from most accounts Keaton remained aloof, seemed adrift, and simply followed orders without a clue as to what Film was “about”—something he continued to voice on television after its release. Yet in what might be called a magical six-degrees-of-separation method of research, Lipman finds a number of happenstances that point to an inevitable convergence of the two artists. Consider, for example, that Beckett may have gotten the name of his most famous, nonexistent character from a comic play of Balzac’s titled Mercadet, the Napoleon of Finance, which also has a character absent throughout the play whom everyone is waiting for, and whose name is Godeau. Consider further that a minor film version of Mercadet, The Loveable Cheat (1949), starred Buster Keaton. Hardly one to expect us to trust him at his word, Lipman provides us with a clip from the latter, with Keaton and the climactic scene in which two actors enthusiastically announce the return of Godot—naturally offscreen. Given the range of Lipman’s restorations—films by Kenneth Anger, Bruce Conner, Shirley Clarke, John Cassavetes, and Charles Burnett among them—it is hard not to read the skepticism he voices at the outset of Notfilm as simply a ploy to grab the viewer’s attention. Since this would hardly be necessary for film-savvy viewers, it may be that he has in mind another audience—students of film history, for example. Not that there isn’t plenty here to engage theatrical spectators, even at a two-hour-plus running time. When Notfilm is not embarking on a lengthy excursion into Beckett’s biography, with information and brief clips from stage versions of his plays, it provides artistic contexts and biographical data on its other luminaries: Keaton, Rosset, and Schneider, in particular. But Lipman’s kino-essay has legs beyond its immediate theatrical appeal, and enough merit and seriousness to maintain its place as a continued resource for film students and Beckett scholars. Ross Lipman’s Notfilm runs through April 7 at Anthology Film Archives in New York.